As with many other people worldwide, the philosophy and books of James Krenov have long been an influence on my work. What makes Krenov's teaching special for me is that the work he has produced over the years is beautiful and timeless. Seeing his work in books can only give you an idea of what it looks like in the flesh and as I am unlikely to see one of his cabinets, I thought I would make one! This is not an exact copy of one of his pieces but it is strongly influenced by his style and scale. 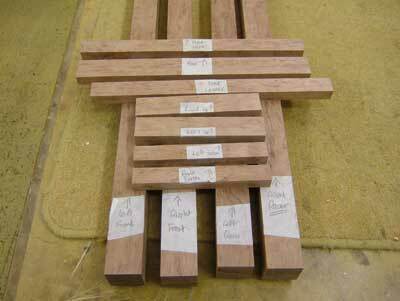 The starting point for the piece was to choose some suitable wood. 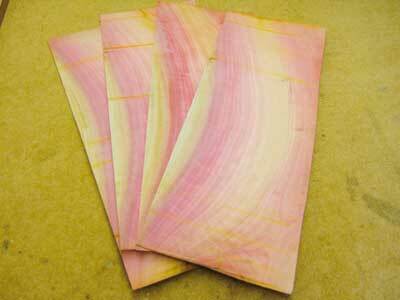 I had a lump of pink ivory (Berchemia zeyheri) purchased from Timberline in stock for a year or more. The curved grain and bright, changing colours would make a dramatic pair of bookmatched doors. As this was a speculative piece for my own 'consumption', I decided to use it. As with my jewellery cabinet, the only practical method of construction to ensure future stability was to use veneers over a man-made core. The veneers were cut on the bandsaw to a thickness of 3mm (1/8in) and then smoothed through the wide belt sander to a finished thickness of 2.5mm (3/32in). 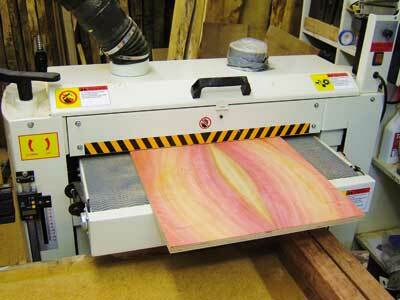 The edges of the man-made core were lipped with solid wood before the veneers were glued up in the vacuum press. 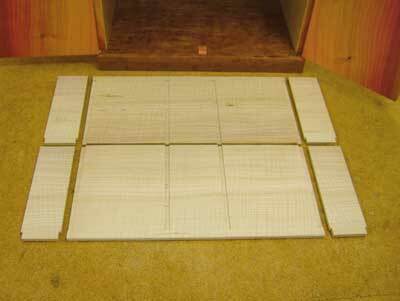 The inside veneers were cut from rippled ash (Fraxinus excelsior) to give a contrast to the cabinet interior. 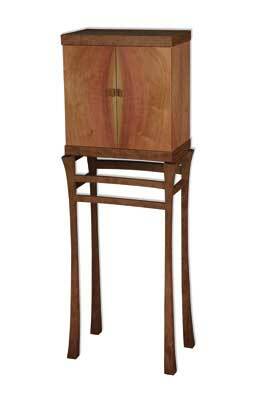 The base and top were veneered and lipped in a similar manner, cut from a nice board of figured bubinga (Guibourtia demeusei). All panels had a final pass through the thickness sander to ensure they were flat and even without the risk of tearout - the model I use is the Senior Sander from Axminster, which has proved to be an excellent machine at a reasonable price. The panels are then scraped clean with a cabinet scraper and lightly sanded with fine paper. 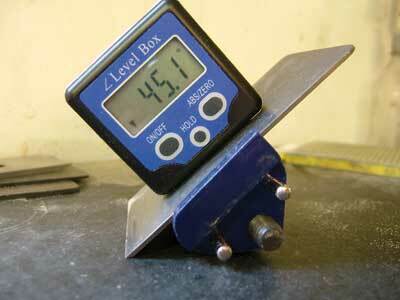 Setting a repeatable angle for sharpening the scraper plane blade is easy with a magnetic digital level box. The guide is an Eclipse copy from Axminster, which opens wide enough to take all scraper plane blades. 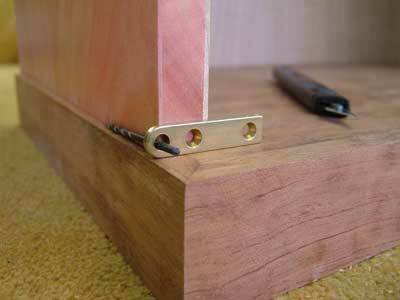 The jointing method used for the carcass was dowels. These were drilled using the excellent Joint Genie which allows perfect alignment, which is so necessary with dowelling. 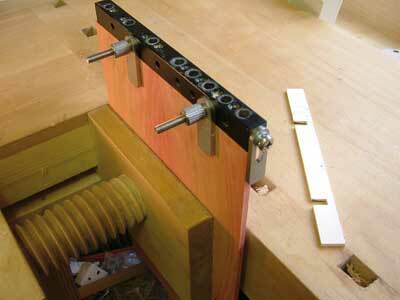 Note the shop-made insert used to provide the offset for the base/top to overlap the sides. 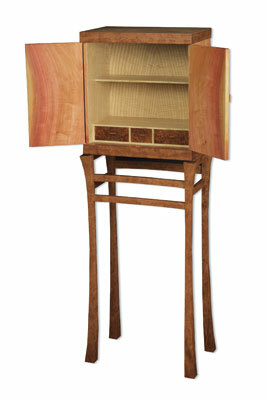 This jig is styled on the Krenov version shown in The Fine Art of Cabinet Making, by James Krenov. 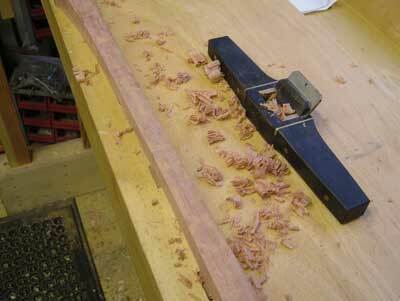 The position of the knife hinges needs to be done carefully to achieve an even reveal. 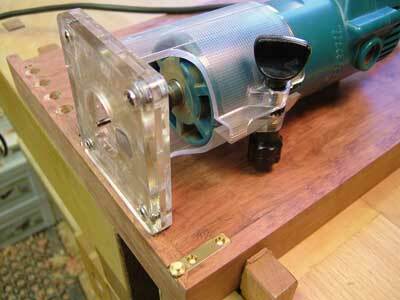 Using a drill bit slightly larger than half the pinhole helps with positioning before marking with a sharp knife. The hinge recesses were routed with a small laminate trimmer, ideal for this size of work, and chiselled back to the knife lines. 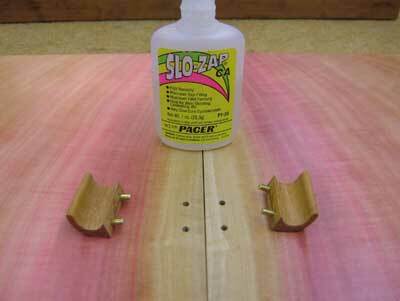 Before glue-up, all panels are finished, which is much easier at this stage and makes cleaning up of any glue squeeze-out simple. The chosen finish of U Beaut Traditional Wax Polish was purchased on holiday in Australia last summer. It claims to leave no finger marks and despite its odd name, it really works! It also has much less of a darkening effect than other waxes, leaving a very natural look. I used the typical Krenov style catches, which are recessed into the cabinet top and adjusted with a small spring, robbed from a ballpoint pen. 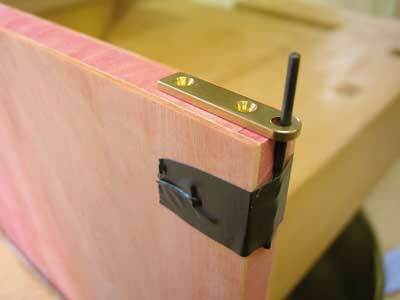 A matching notch in the door locates the catch and makes a nice woody click when closed. 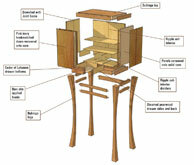 The 'lifter' is designed to counteract the force of the catch and is recessed into the base of the cabinet. In practice this was irrelevant as my chosen catch pressure was not enough to bring it into play. The ruler gives an idea of the diminutive scale of the parts. The door handles were made from a small piece of very precious Cuban mahogany (Swietenia mahogoni), long ago banned from commercial exploitation. This was shaped in one piece and then cut into two to give a nicely matched pair. In scale with the cabinet, I made these just big enough to hold with a finger and thumb. 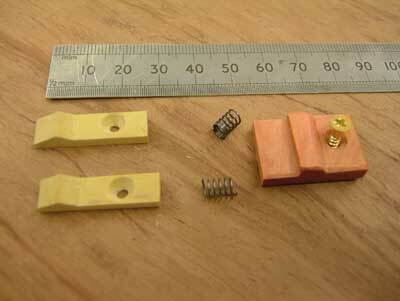 I used 3mm (1/8in) brass tenons fixed with high viscosity super glue, which provided an invisible and secure fixing. Care was needed to drill the holes accurately to ensure the handles lined up nicely. 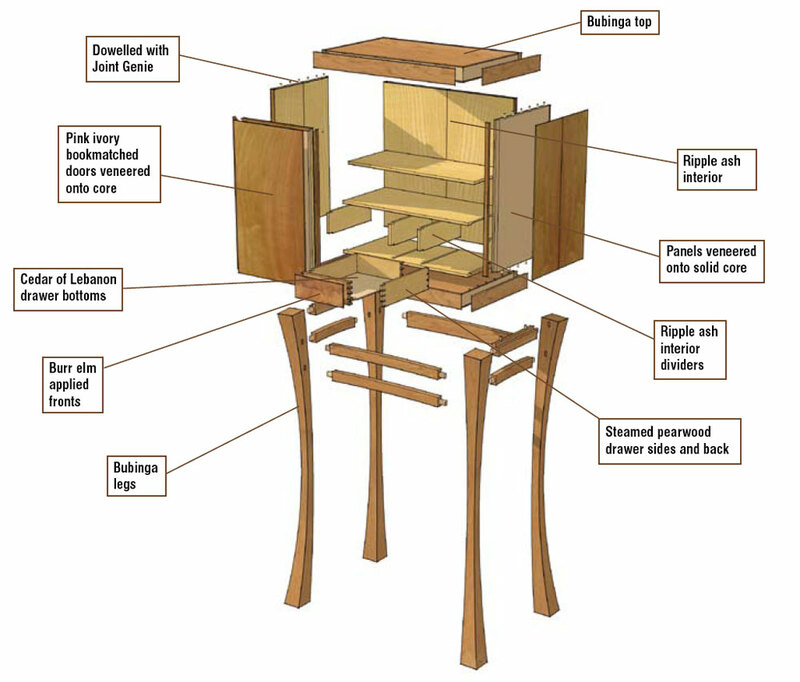 The interior drawer carcass was made from solid rippled ash with housing joints routed with the aid of the superb and deadly accurate MicroFence. Although this is expensive, it is one gadget that's well worth the money! The base of the drawer carcass was screwed in place towards the back, which would allow for wood movement, although the chosen material was quarter-sawn to minimise this. 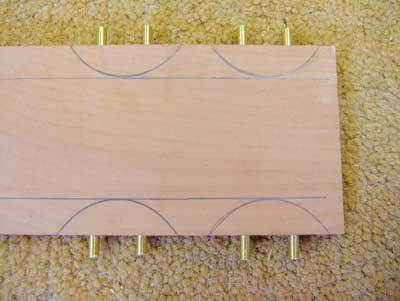 The other pieces were assembled in the same grain orientation and glued in place. 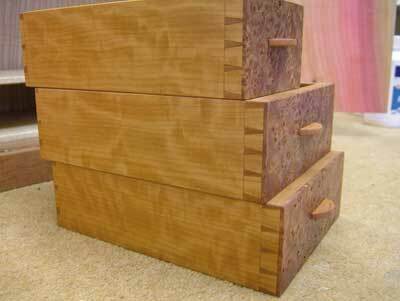 The drawers were through dovetailed in steamed pearwood (Pyrus communis), which is a fine but unforgiving wood that needed extra care when dovetailing. The rippled grain was planed with a high angled block plane to avoid tearout. 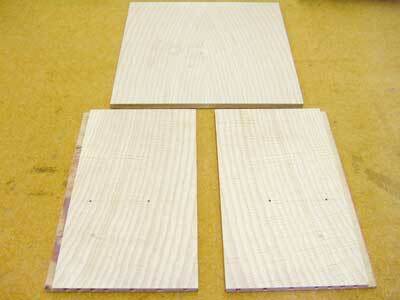 A planing board with a 3mm (1/8in) high stop is ideal for planing thin components such as drawer sides. 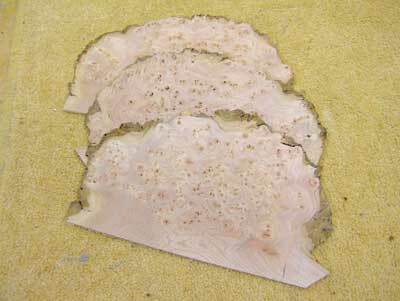 The applied fronts were cut to 2.5mm (3/32in) from a very nice but small piece of burr elm. 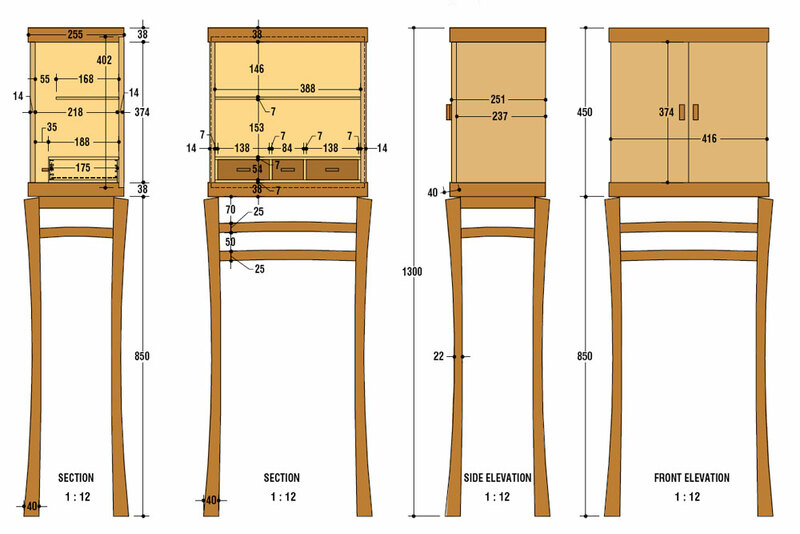 Using this method instead of using conventional half blind dovetails is less wasteful of precious burr, and gives a crisper finish. The close match of the burr elm to the end grain pearwood looks good. 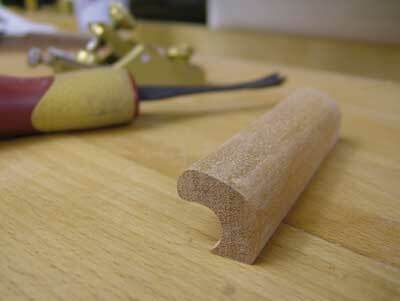 The drawer handles had their 3mm (1/8in) brass tenons inserted before cutting out and shaping. The handles had carved recesses added for easier handling, and the drawer bottoms were recessed into grooves in the sides and made from cedar of Lebanon (Cedrus libani) for its fragrant aroma. With the cabinet complete, it was time to build the stand. 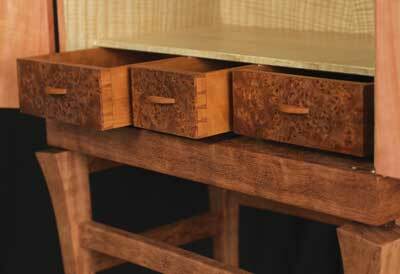 I used bubinga again as this worked harmoniously on the cabinet. Although there are numerous curves, the actual joints are cut square, which makes things a lot easier! 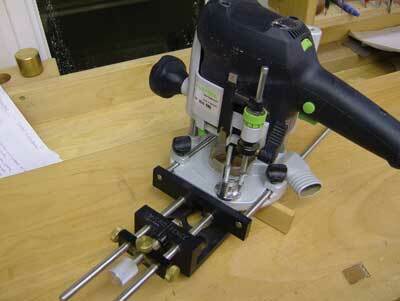 The chosen method was with my new Domino jointer, which employs accurately formed loose tenons. I drew on the curves from cardboard templates, which allowed me to position all the joints in the correct places. Once this was done, the actual joints were quickly made. The work needs to be firmly held - especially with smaller components - and I securely clamped each piece to be sure of a good result. Dry assembly was carried out to make sure everything fitted and the cabinet located properly. I found forming the curves a nerve-racking process as it would be so easy to create a curve on the wrong face or in the wrong direction. The main waste was removed freehand with the bandsaw. Whilst this is potentially dangerous, if taken slowly without forcing the work there is no problem. 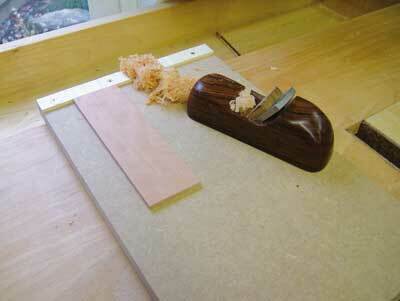 The curves were cleaned up and shaped back to the line with a high angle spokeshave by HNT Gordon. This excellent tool made short work of the task and left little or no tearout on this hard, figured wood. Final finish was with fine sandpaper, followed by two thin coats of wax as before. 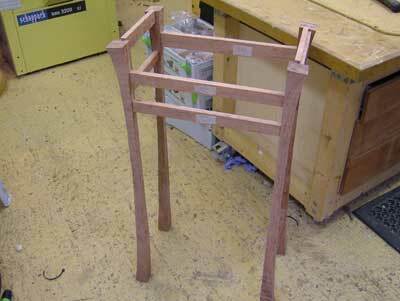 The top was attached to the base with two 8mm (5/16in) dowels, which were preferred to a visible method. 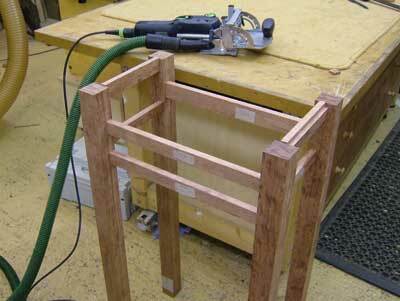 The dowels were glued into the base but not the top, to allow easy removal for transportation. The weight of the top is more than enough to keep everything in place. sensation after spending so many hours looking at Krenov's pieces in books. It took 90 enjoyable hours to make and I'm very pleased with the result. "I found forming the curves a nerve-racking process"